c) a fellow diner with a good liver and the ability to appreciate your efforts and skill. Mince mutton with 2 onions, season with salt and pepper, add 2 Tbs uncooked rice and finely chopped parsley and dill. Mix well, divide mixture into four parts and shape four balls with a prune in the middle of each one. Cover mutton bones with 4-5 cups of water and make stock. When cool, add 1 finely chopped onion, 3 Tbs rice, potatoes cut into quarters, finely chopped tomatoes, parsley and dill, add salt and pepper to taste, and bring to the boil. As soon as the stock boils, add balls of meat and simmer for half an hour on a medium gas. Before serving add beaten egg and chopped dill. Clean and sort over rice, add salt to taste, add cold water and leave for 7-8 hours. Drain, sprinkle into boiling water, lightly salted, and boil until half-cooked. Use plenty of water, drain in colander and wash in the water in which the rice has been cooked. To prepare dough - mix flour and sour cream, and salt according to taste. Take a saucepan (if possible with a curved bottom), put in a table-spoonful of clarified butter and bring to boiling point. Line the bottom of the saucepan with a thin layer of dough and keep it on a low gas for 2 minutes. Heap the rice (previously boiled) in the pan, immediately add ¼ lb butter, cover with a closely fitting lid and cook in a low oven for 40 minutes. 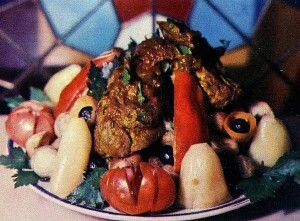 Cut mutton into small pieces, as if for ragout, and fry in butter on all sides until brown. Cut onions into large pieces, add to them the dried fruit, mix, season with salt and pepper, put it all in the frying pan with the meat and cook them together for a further 20 minutes. Turn it all out into a small saucepan, add a little meat stock and cook until quite tender. Place the meat and rice on a plate, but without mixing them. Decorate with pieces of dough. Serve very hot. 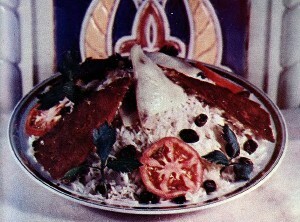 Prepare rice and dough as for mutton pilau. Boil a spring chicken until tender, cut into four and steam for five minutes. In serving, first put a layer of rice on the plate, then chicken, then more rice. Arrange pieces of dough round the edge. Slowly fry raisins, dried apricots and almonds (1/2 lb altogether) in butter for 5-7 minutes, and use to garnish the rice. Cut the mutton into two and fry until nicely browned. Put the pan in the oven and cook slowly with the lid on for 20 minutes. Add tomato paste, chopped onion, finely chopped parsley and dill, flour, salt, pepper, mix and transfer to a saucepan. Pour on stock, cover, and cook on a low gas until the meat is tender. This is best served with fried potatoes. First put the potatoes on a dish, arrange mutton on top and then sprinkle with chopped parsley and dill. Slices of lemon and any kind of salt pickle may be served too. Put 2 teaspoons of any kind of tea into a moderate-sized earthenware teapot, half fill the pot with boiling water, cover with a teacosy or towel, and leave to brew for 5 minutes on the edge of the stove near a hot gas ring. Then add ¼ teaspoonful of cinnamon, fill up the pot with water, leave with the lid on for another minute, and the tea is ready.